PUNE: Heavy spells of rain in the catchment areas of four dams supplying water to the city ensured that their collective stock touched the 90% mark for the first time this monsoon. On Saturday evening, collective stock of the four dams stood at 26.02 TMC (89.24%) with Panshet and Khadakwasla dams filled to capacity. This prompted the irrigation department to initiate release of water from both these dams all through the day on Saturday. 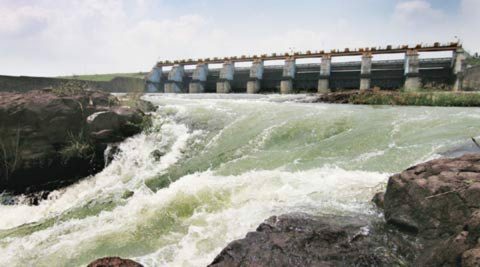 Officials from the irrigation department said the stock in Varasgaon also witnessed a significant rise on Saturday, reaching up to 92%. "More water could be released from Panshet and Khadakwasla on Sunday as catchment of Panshet and Khadakwasla dams continue to receive heavy showers," they added. Water from Panshet and Khadakwasla was released at 990 and 850 cusec, respectively. The irrigation department had released water from Panshet at about 1,500 cusec recently. An official from the department said, "Rainfall activity has been vigorous since the last seven days in Khadakwasla irrigation circle. In 36 hours ending Saturday evening, Temghar recorded over 120 mm rainfall while Panshet and Varasgaon each registered 80mm rainfall. The collective stock is now marching towards 100% mark. We are expecting more rainfall in the next two days in the catchments, following which more water will be released into river," he said. The department has maintained water stock in Temghar below 50% because of ongoing repair work of the dam's wall. "We would release water during Ganesh festival on immersion days. The schedule was being chalked out and will be announced soon," the department said.